In this latest edition of The Health Wrap, Associate Professor Lesley Russell takes a look at the Pharmaceutical Benefits Scheme and how to make better use of the skills of pharmacists, and reviews developments in two important areas MIA in the Budget (Aboriginal and Torres Strait Islander health and obesity). As well, Russell reports on a proposal for long-term monitoring of medical graduates, and a good news story from the United States about horticultural rehabilitation (AKA gardening for wellbeing). 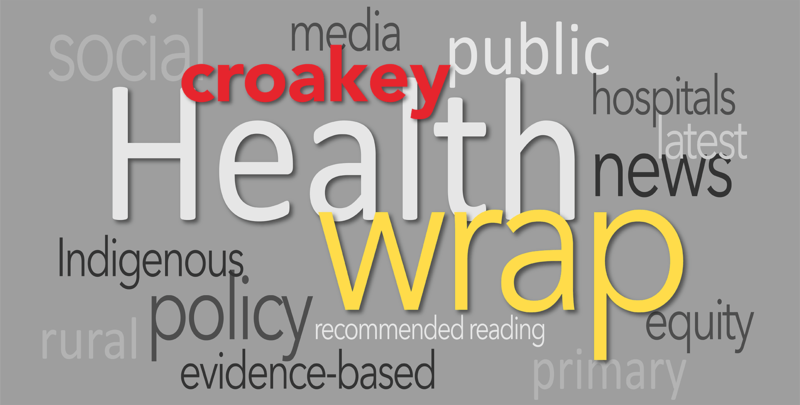 This edition of The Health Wrap is going to mostly (but not completely) ignore this week’s Federal Budget, because it has been and will continue to be covered in some detail elsewhere on the Croakey site (a great job from Croakey colleagues on pulling everything together so comprehensively and so quickly). Wrapping reaction to the Federal Budget and its implications for health and healthcare. Back in Black or Highway to Hell? The people in most need receive the least, and other #Budget2019 analysis. You will also find a good summary of the health and aged care issues here on The Conversation. A particular mention (although I’m not writing for them this year): those interested in the impact of the Budget on women should go to the website of the National Foundation for Australian Women. (Also, see Croakey reports on Labor’s Budget reply, regarding cancer treatment costs and concerns among Aboriginal and Torres Strait Islander groups about Labor’s lack of action on poverty). This is not an aspect of healthcare that gets as much attention as it deserves – except from the Government. Health Minister Greg Hunt is always happy to tell us when a new medicine is listed on the PBS, and it’s a government mantra (included in the Treasurer’s Budget night speech) that a strong economy means more medicines get listed. That’s true, but it’s worthwhile noting that despite the addition of a significant number of expensive new medicines, the Budget shows the cost of the PBS is predicted to decrease significantly over the forward estimates (from $13.5 billion in 2018-19 to $10.7 billion in 2021-22). Useful PBS data are available here. Some economists believe that Australia could do more to lower the costs of prescription medicines, which make a significant contribution to patients’ out-of-pocket costs. In 2017, the Grattan Institute published a report that found that Australians pay more than $500 million a year too much for their prescription drugs. The report argued that taxpayers and patients would pay less if the Federal Government made some simple changes to the way prices are set under the PBS. In particular, it argued for changes in the way the PBS priced off-patent generic medicines and in the rules that govern which medicines are interchangeable. Some 25 percent of PBS funds goes to pharmacy. Are we getting value for that spend? A Community Pharmacy Agreement (the sixth agreement will expire in 2020) governs the payments and programs under which PBS funds flow to community pharmacies for dispensing PBS medicines, providing pharmacy programs and services and for the Community Service Obligation arrangements with pharmaceutical wholesalers. At the time of signing, in 2015, the funding provided was $18.9 billion, but more funds have been added since (including $245 million in the latest budget). It’s always insightful to look at what the powerful pharmacy lobby wants – and usually gets – at Budget time and election time. The Pharmacy Guild’s pre-budget submission is here and the Pharmaceutical Society of Australia’s submission is here. After the Budget, the consensus from both PGA and PSA is that more money is needed. Surprise! My sense is that pharmacists are under-utilised members of the healthcare team, and that currently they get paid a lot of money to do work that is not always valuable, in part because of the usual and endless professional turf wars. John Menadue, writing on his Pearls and Irritations blog, is much blunter: he says pharmacists are the most under-utilised health professionals in the country but the PGA’s focus on funding over scope of practice keeps things this way – and helps drive out-of-pocket costs. He says that the PGA killed a recommendation by the Pharmaceutical Benefits Advisory Committee that would have doubled the number of medications that could be dispensed from a single prescription for some of the most frequently prescribed medicines such as those for high blood pressure and cholesterol. The Grattan Institute makes the case that pharmacy regulation in Australia is well overdue for reform. In a report released last month, Professor Stephen Duckett looks at boosting the role of pharmacists in primary care. He proposes using pharmacists’ skills better by allowing suitably prepared pharmacists to prescribe, stating that this will improve people’s access to health care, facilitate better medication management, reduce costs, and ease the burden on general practice. I know it’s not possible to mention every issue of the day in a Budget speech, but I was pretty horrified that the Treasurer’s had not a single mention of Closing the Gap or addressing the factors contributing to disadvantage for Aboriginal and Torres Strait Islander people. The fact is, there was very little in the Budget for Aboriginal and Torres Strait Islander peoples’ health and related issues like housing. You can read the responses from Indigenous organisations here. The Budget reality is a sad contrast to what was put forward in the sector’s pre-Budget submissions. 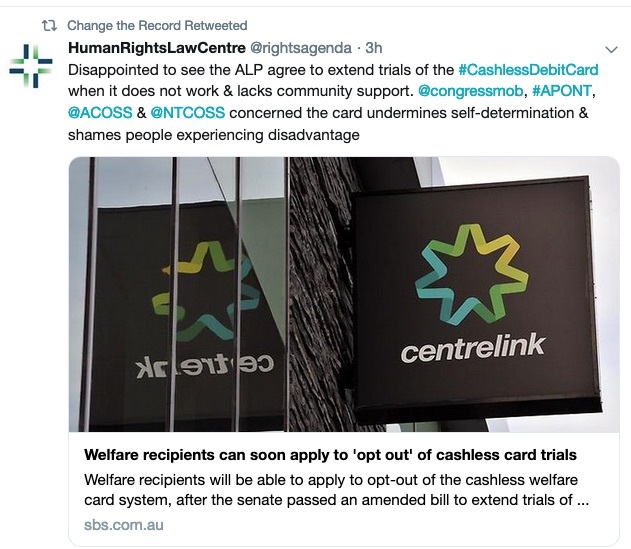 Despite reports from peak Indigenous organisations and social welfare groups that the cashless debit card policy discriminates against Aboriginal and Torres Strait Islander people and the findings of the Auditor General that “it is difficult to conclude whether there had been a reduction in social harm and whether the card was a lower cost welfare quarantining approach”, an “expansion and extension” of the program is included in the Budget. However, I join those who are optimistic about the long-term implications of the recent announcement of a partnership agreement between peak Indigenous organisations and Australian governments on Closing the Gap. This is the first time that Aboriginal and Torres Strait Islander voices have not only been invited to the table but empowered with shared decision-making responsibilities. This opens up very real possibilities for the utilisation of community knowledge and expertise and consequent community engagement and ownership. The new Joint Council on Closing the Gap has twelve representatives from peak organisations, a nominated minister from each of the federal and state and territory governments, and a local government representative. It had its first meeting on 27 March. The communique from the meeting is here. There are a number of recent reports on Aboriginal and Torres Strait Islander issues that I’m listing here in case you missed them. Good housing for good health. But it also highlights stories that illustrate success from Aboriginal and Torres Strait Islander perspectives. NITV highlighted these optimistic stories of Black excellence. • It was great that Croakey colleague Marie McInerney attended and tweeted the April 2 forum in Melbourne, hosted by Australia’s National Institute for Aboriginal and Torres Strait Islander Health Research, where the Lowitja Institute showcased Indigenous research translation in action. Marie is reporting on the event for the Croakey Conference News Service (and will be publishing more stories). • Aboriginal and Torres Strait Islander health was a key issue at the recent National Rural Health Conference in Hobart. You can read the recommendations from the conference here. • A statement from the Centre of Best Practice in Aboriginal and Torres Strait Islander Suicide Prevention on the message the spate of recent child and youth suicides in Indigenous communities sends to Australian society. An accompanying article was published in Croakey. • A year has passed since the release of the Pathways to Justice report on Indigenous incarceration by the Australian Law Commission and there has been no Government response. The Law Council of Australia has called out the shameful lack of action by all Australian governments, saying that it has been met with “deafening” silence. BTW: The Close the Gap Steering Committee has developed a resource to help improve the understanding of the differences between the Close the Gap Campaign and the Government strategy on Closing the Gap. If you take out funding for sport (mostly organised and elite), the only initiative in the Budget that addressed obesity issues was $1.1 million over two years for the Health Star Rating System. A classic case of kicking an expensive can down the road which will ensure it becomes even more expensive. 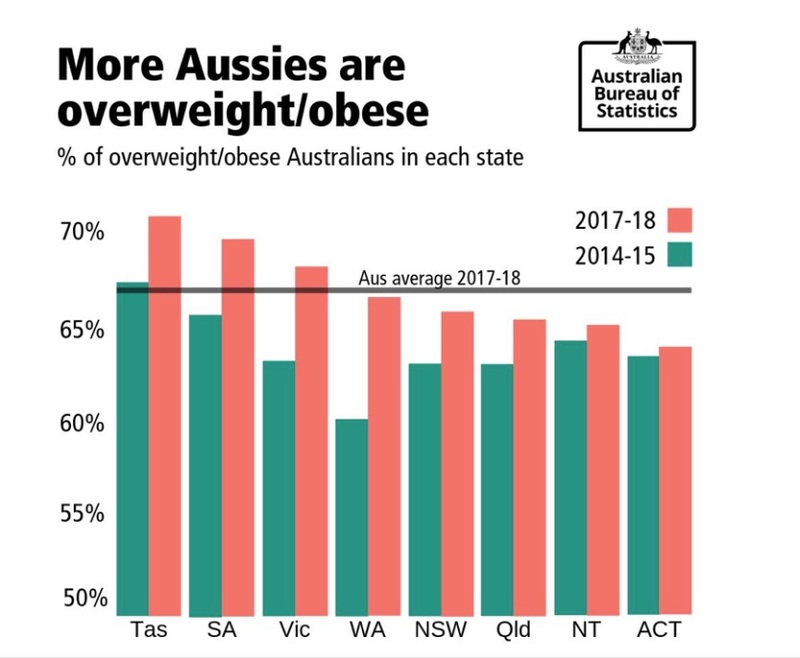 There’s been plenty of recent news about Australia’s rising obesity levels, as highlighted by this graph from the Australian Bureau of Statistics. The percentage of Australians classified as overweight or obese has continued to rise. Tasmania has the highest rate at 71 percent and the ACT has the lowest at 64 percent. These are results from the 2017-18 National Health Survey, released in February this year. A new report from the Obesity Collective, Weighing in: Australia’s Growing Obesity Epidemic, highlights the extent and the impact of obesity. The proportion of population living with obesity has increased to 31.3 percent – that’s 5.8 million people. If this trend continues, over 40 percent of Australian population will be living obesity in the next 10 years. Each election cycle that we wait to take action, one million more adults will be affected. That is definitely kicking the can down the road. Alessandro Demaio made this point very effectively when he spoke at the National Press Club in the lead up to the Budget. You can read his speech here. Clearly no-one from Health or Finance was listening! It’s not just a health issue, it’s an economic issue. The economic burden of treating obesity-related diseases is estimated to reach $21 billion by 2025. In other words, for every dollar we are spending on prevention, we’ll soon be losing $10 for our lack of action on obesity. A recent publication by Australian authors highlighted the problems faced in addressing overweight and obesity. Too often the interventions chosen are implemented over short time frames and with small scale investments. This bias to short-term, limited policy actions over a comprehensive, sustained approach, means that the most cost-effective actions are rarely selected or only partially adopted. Critically, the paper makes the point that governments under-estimate the robust interventions needed to address market failure and offset heavy lobbying from the industry. The most cost-effective strategies to prevent childhood obesity “are those most vigorously opposed by industry”. Time to establish comprehensive long-term monitoring of Australian medical graduates? This is the (somewhat controversial) title of a (somewhat controversial) paper published recently by Christine Jorm and colleagues that proposes long-term monitoring of medical graduates. They argue that the wellbeing of medical students and graduates matters too much not to ask, “How do they feel?”; that society and doctors themselves have invested too much in their education not to query “How well are they performing in the workplace?”; and that accountability to the community demands we ask, “How are their patients going?”. I commend this article to you – put it on your reading list. On a related topic, I am a big fan of encouraging and assessing the “social mission” of medical schools. It essentially measures medical graduates working in primary care, in medically under-served regions, and how many are from minority groups. I loved this story in The New York Times about horticultural therapy in rehabilitation. The American Horticultural Therapy Association was founded in 1973, but it credits Dr Benjamin Rush (a signer of the Declaration of Independence) with the first modern Western documentation of the curative benefits of “digging in a garden”. However the concept of nature as a healing agent certainly predates him. Enclosed gardens, in particular, were used in a hospital context at least as far back as the Middle Ages.